Over the past couple of weeks I have been pondering the future and as I have stated numerous times I am hoping Donald Trump will succeed as president and also that he will not follow through on some of the very radical ideas that he proposed during his campaign. I am hoping that he will be guided by reason but I am afraid that many of our civil rights will disappear over the next few years, and that his economic proposals will end up people who voted for him hoping that it would benefit them in terms of their jobs and their future. In light of that I have been thinking a lot about the responsibility that all of us have as citizens, not to our political parties or ideology, but to the country and the whole idea of liberty. That may sound like an old fashioned and quaint proposition to people whose life is devoted to ideology, no matter if that is a conservative, liberal, progressive, or even religious one, but it is still something that I think is important. As usual that thought took me back to Abraham Lincoln and the American Civil War. 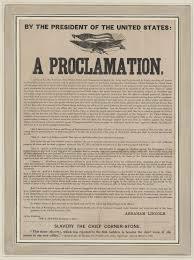 I as reminded of some remarks that Lincoln made less than two weeks before he signed the Emancipation Proclamation. At the time it was still a controversial proposition, even for many people in the North, as is almost any proposition to expand the boundaries of liberty. The fact is that over the next few years many liberties will probably be rolled back as Trump appoints people to his cabinet who are opposed to almost every expansion of liberty going back to the 14th and 15th Amendments, the Civil Rights and Voting Rights Acts, LGBTQ rights, Women’s Rights, and even the rights of Workers. “I do not forget the gravity which should characterize a paper addressed to the Congress of the nation by the Chief Magistrate of the nation. Nor do I forget that some of you are my seniors, nor that many of you have more experience than I, in the conduct of public affairs. Yet I trust that in view of the great responsibility resting upon me, you will perceive no want of respect yourselves, in any undue earnestness I may seem to display. Is it doubted, then, that the plan I propose, if adopted, would shorten the war, and thus lessen its expenditure of money and of blood? Is it doubted that it would restore the national authority and national prosperity, and perpetuate both indefinitely? Is it doubted that we here–Congress and Executive–can secure its adoption? Will not the good people respond to a united, and earnest appeal from us? Can we, can they, by any other means, so certainly, or so speedily, assure these vital objects? We can succeed only by concert. It is not “can any of us imagine better?” but, “can we all do better?” The dogmas of the quiet past, are inadequate to the stormy present. The occasion is piled high with difficulty, and we must rise — with the occasion. As our case is new, so we must think anew, and act anew. We must disenthrall ourselves, and then we shall save our country.